Seabourn Odyssey spends her days chasing the sun in the northern hemisphere. During the warm months of Europe’s summer cruise the Mediterranean on this luxurious ship, with departures from Barcelona, Rome, Lisbon, Monte Carlo, Athens and Venice. Highlights of her Mediterranean season include itineraries that could have you cruising the islands of Greece, walking the cobble stoned streets of ports along the Adriatic Sea or immersing yourself in the culture of Morocco and the Canary Islands. As the weather starts to cool in Europe, Seabourn Odyssey makes her way across the Atlantic to the tropical waters of the Caribbean. From here she operates a series of 7 night one-way cruises or 14 night round trip cruises departing either from Philipsburg in St Maarten or Bridgetown, Barbados. View all Seabourn Odyssey cruises, view a selection of Seabourn cruise deals or view more options for Seabourn cruises. 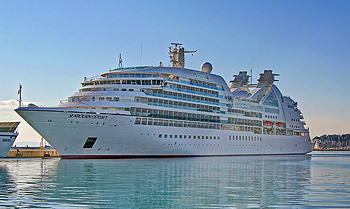 Seabourn Odyssey was built by the Italian company T. Mariotti S.p.A., located in Genoa, Italy and named in Venice in June of 2009. On that occasion, the guests on board for the maiden voyage were all honoured as the ship’s godparents, and a plaque with their names was permanently mounted on a wall inside the ship. Seabourn Odyssey was designed by the same architectural team, Petr Yran and Bjorn Storbraaten, who designed the original Seabourn ships. Highlights in accommodations are the exceptional Wintergarden Suites, which have a private glassed-in Solarium with a soaking tub and a lounging bed. This suite also features a veranda that is bowed out, giving wonderful views long the side of the ship. The Signature Suites, located all the way forward on Deck 7, have over 900 square feet of inside space and a spectacular wrap-around veranda of 353 square feet. In addition to more larger suites, Seabourn Odyssey‘s additional size is utilised to create more open deck space, and a variety of public rooms and dining venues. Some of life’s most cherished moments occur around the table, and every meal with Seabourn is another opportunity to celebrate. Seabourns award-winning cuisine starts with the finest quality ingredients, infused with authentic regional flavors, prepared á la minute by our skilled chefs and served with pride.